Club foot, also called congenital talipes equinovarus or CTEV, is a fairly common condition that affects the lower leg. "Congenital" means present at birth, "talipes" means affecting the foot and ankle and "equinovarus" means pointing downwards and inwards. Around one or two babies in every 1000 born are affected with club foot, and half of them have both feet affected. It is more common in boys than girls. Why does my baby have club foot? Nobody knows what causes club foot, but it may possibly be something that runs in the family, or it may be because your baby's muscles didn't form properly in the womb. But club foot is treatable, and your child will be able to live a normal, active life after they are treated. 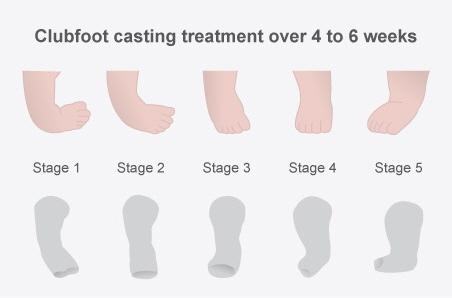 Worldwide, club foot is treated using the Ponseti method. There are three stages to the Ponseti method, and you can find out more information on the Ponseti International website. You can also watch this video about the Ponseti method. Ideally, you will have an appointment with the Orthopaedic Outpatient Department (OOPD) before your baby is born so you can get the information you need and prepare for treatment. If this is not possible call the department on (03) 364‑0800 ext. 88692 to talk to a nurse. Your midwife or doctor should contact the OOPD as soon as your baby is born. You will then get an appointment with an orthopaedic surgeon to discuss starting treatment. This is the first stage of treatment. Ideally it should start in the first two weeks after your child is born. Plaster of Paris is used to mould your baby's foot into position and hold it in place. Soft fibreglass then goes over the top of the plaster, extending over your baby's knee and covering their thigh to keep the cast in position. The cast is changed every week for four to six weeks. Casting does not hurt your baby. When the cast is first taken off at hospital, the nurses will show you how to do the first part of cast removal at home, before your future appointments. Run a warm bath for your baby (either in a baby bath or a large sink). Unwind the soft coloured fibreglass outer shell of the cast. Remove the cotton wool around your baby's thighs, leaving the white plaster of Paris intact. Soak the plaster casts by putting your baby in the bath. Massage the casts until they are completely wet and soft. Dry and dress your baby's top half – a nightie might be a good idea. Put small plastic bags over your baby's plaster casts. Put long warm socks over the bags to keep your baby warm and dry. Nurses in the Orthopaedics Outpatients Department will unwrap the plaster casts. This is the second stage. Once your baby is out of a cast they will probably need to have a small operation to release the tight, short tendon at the back of their heels (the Achilles tendon). This is called a tenotomy. Your baby will have the tenotomy under a general anaesthetic (they will be asleep). It is a very short procedure. Their foot will be put in another cast, which will stay on for three weeks, while the tendon grows and heals. This is the final stage of treatment, and is very important. Once your baby's foot is in the right position and their Achilles tendon has healed they need to be in boots and bar to hold their feet in the right position. If they don't wear the boots and bar it is very likely that their muscles and ligaments will tighten and pull their foot back into an abnormal position. The boots and bar your baby wears are made just to fit them. A nurse in the Orthopaedics Outpatients Department will show you how to put these on. Your baby will need to wear the boots and bar for 23 hours a day for the first three months. After this, the time is gradually reduced until your child is wearing the brace at night and nap time, at least until they are 2 years old, and maybe for longer. This may seem like a very long time, but most babies and parents adapt quickly to the brace and it becomes part of normal life. Joining an online parent support group can be helpful (find them through the suggested websites at the bottom of the page). 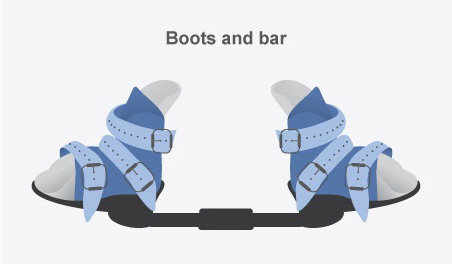 Once your baby is in the boots and bar, you will have fewer follow-up appointments. If you have any concerns about how they are fitting or your baby's feet, phone the Orthopaedics Outpatients Department on (03) 364‑0800 ext. 88692. When putting them on, lay your baby on their back or sitting with their feet towards you. Your child should always wear socks. The buckles go on the inside of the foot. It can be difficult to slide your baby's feet into the shoes. Hold their foot on either side of their ankle, and put in to the back of the shoe – as far back and down as you can get it. Hold their foot in this position while doing the buckles up. If their foot moves, put it back in the right position. Do the middle buckle up first, followed by the top and bottom buckles. The middle strap is the most important strap – make sure this is nice and tight. Make sure there are no kinks in the leather. Don't expect the heel to always come down right from the start – sometimes it can take a few weeks. Make sure the length of the bar (from middle screw to middle screw) is the same width or slightly longer than the width of your child's shoulders. The staff will provide you with a key to adjust the bar. Weekly plaster cast changes for around four to six weeks. Tenotomy (if needed). A plaster cast is reapplied, then removed at the clinic after three weeks. Shoes and bar are fitted. For three months your child wears them for 23 hours a day. Afterwards they wear them while asleep until they are at least 2 years old. Almost all children treated early for club foot lead normal, active lives. They will continue seeing an orthopaedic surgeon until they stop growing, to make sure their foot is staying in the right position. This YouTube video explains treatment with the Ponseti method, and also has parents describing how it worked for them and their children. Information, resources and support for parents of children with club foot. Information about club foot and the Ponseti treatment method. Information, tips and support for parents. Written by HealthInfo clinical advisers. Endorsed by director of nursing, Orthopaedic Services, Canterbury DHB. Page created June 2015.